Will cars of the future run on liquid nitrogen? With all the hype surrounding electric cars and hydrogen-powered fuel-cells, it's easy to think hydrogen is the future of automobiles. But as people start developing and popularizing these enviro-friendly cars, some problems are becoming apparent. And meanwhile, there's a new kid on the block that is threatening to overturn our assumptions about electric cars — and its name is liquid nitrogen. It turns out that hydrogen as a fuel source is not without its challenges. Hydrogen refueling stations are still few-and-far-between, and the factories and equipment needed for producing, distributing, and storing hydrogen is extremely expensive. And because hydrogen is the smallest molecule of all, it leaks through practically everything — forcing distributors to build special pipelines and storage tanks at extra cost. But if a recent report in the Economist is right, there may be a viable alternative — a rather unassuming one that is extremely cheap and in relative abundance: liquid nitrogen. Because liquid nitrogen is dense and capable of storing considerable amounts of energy per unit volume, cars should be able to run a fair distance on the stuff. And weight for weight, it also packs as much energy as lithium-ion batteries used in laptops, mobile phones, and electric cars. And in fact, its performance is predicted to be comparable to that of an electric car's. The big difference is that a liquid-nitrogen car is likely to be considerably cheaper to build than an electric vehicle. For one thing, its engine does not have to cope with high temperatures-and could therefore be fabricated out of cheap alloys or even plastics. For another, because it needs no bulky traction batteries, it would be lighter and cheaper still than an electric vehicle. At present, lithium-ion battery packs for electric vehicles cost between $500 and $600 a kilowatt-hour. The Nissan Leaf has 24 kilowatt-hours of capacity. At around $13,200, the batteries account for more than a third of the car's $35,200 basic price. A nitrogen car with comparable range and performance could therefore sell for little more than half the price of an electric car. A third advantage is that liquid nitrogen is a by-product of the industrial process for making liquid oxygen. 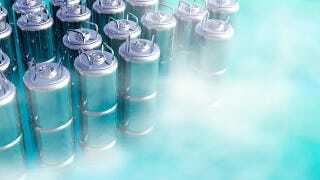 Because there is four times as much nitrogen as oxygen in air, there is inevitably a glut of the stuff-so much so, liquid nitrogen sells in America for a tenth of the price of milk. Finally, a breakthrough in engine design has made liquid nitrogen an even more attractive alternative than the lithium-ion batteries used in electric cars. An invention made by an independent British engineer called Peter Dearman dispenses with the costly heat exchanger that is needed to vaporise the liquid nitrogen quickly. Instead, a small amount of water and anti-freeze (eg, methanol) is injected into the cylinder just as the liquid nitrogen is drawn in, causing it to boil and expand rapidly — thereby forcing the piston down inside the the cylinder. "Without that," says Mr Dearman, "you had to have a multi-stage engine, which is cumbersome, inefficient and expensive." Cool! Literally. Just don't drink the stuff, okay?